Currently there is a spring recruitment period in the non-government organization AIESEC in all 107 countries and territories where it is present (including my home country Moldova). This can be determined by various posters and banners with powerful messages or simple, but real stories, presentations (called “Big Picture”) and info desks at universities, on-line articles and so on. Truth to say, I am not so good in inspirational speeches and promotional articles. So, I will answer these questions as objectively as I can, with positive and negative points, with successes and disappointments, with personal examples and opinions of other AIESEC members. When you look at all those happy faces from the “I am an AIESECer” posters and photos / videos of various events, you perceive AIESEC as a positive, successful and rapidly growing organization, where all members live and work as in a fairy tale. Yet, this is not quite the truth. The organization itself is neutral. It does not transform you into a successful leader – it only gives you a large variety of tools and environment you can use to “mold” this leader out of yourself. The descriptor clearly points this out: “AIESEC – the international platform for young people to explore and develop their leadership potential.” You see: this is only the PLATFORM for you to use as a trampoline to reach new heights, which is much harder to do without it and alone. Emerging from the previous fact, the second one becomes obvious: in spite of the 60-years global growth and many successful experiences AIESEC is not the ideal place. It is all about PEOPLE. And all people make mistakes. Due to this point I have tried to quit AIESEC about seven times during my 3-years experience here… but even after becoming an alumnus still remain close to it. Why? 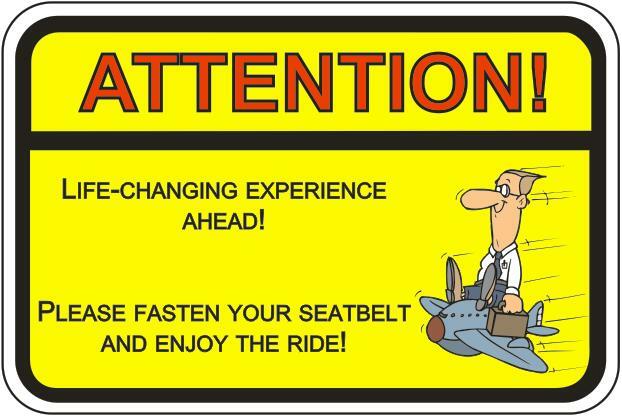 Just let us look at this fact from the other side that considers such well-known idea: “Your most powerful learning experience is obtained through your own mistakes”. Compare two young persons of about 21 years old, who plan to start their business. The first one, who just graduated from a university, has no or little idea of what is project management, how to manage a team, and what to do when risks knock boldly on your front door. The second one, who combined university studies with volunteering in AIESEC, has already experienced these and many more things, and now is able to use them effectively and efficiently. A rhetorical question here: Who has more chances to become successful entrepreneur? 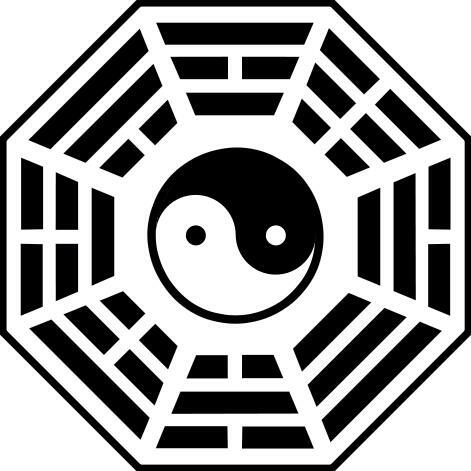 Now, I propose to combine the “neutral” character of the organization and all challenges and not so pleasant experience it might hide. And what do we get here? Yes, YOUR OPPORTUNITY! It means that it is YOU together with other members who make the organization as it is. You do not like the destination it goes to? – Become a leader of the project / conference / committee, propose your direction and strategy, and lead your team. You consider there is lack of professionalism and quality in providing internship services? – Apply for the so-called eXchange Quality Board and improve them on the global level. You notice unethical attitude and behaviour? – Go for the International Ethics Subcommittee or even establish your local one and educate members on the importance of ethical leadership. As you see, the present and future of AIESEC depends on each member of the organization, including YOU. It will be what you all, together, make of it. No more, no less. More information and videos can be found HERE. 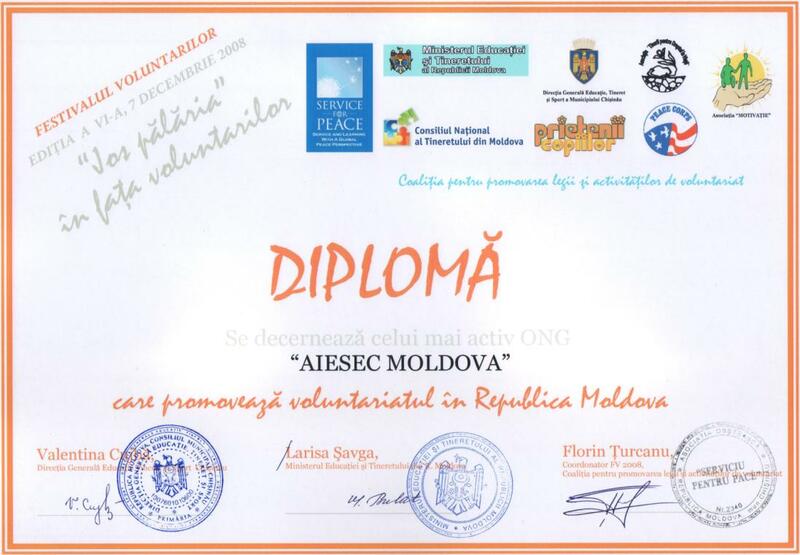 In the year 2008 while being in the National Executive Board (MC) of AIESEC Moldova we applied for The Most Active NGO That Promotes Volunteering in Moldova Award given during the annual event called “The Festival of Volunteers”. And… what do you know… WE TOOK IT! You can read about the event and all awards in the articles HERE and HERE (in Romanian). This year I decided to test my luck and apply for The Most Active Volunteer Award available also within the above-mentioned event. In my application form I described my experience in the National Board of AIESEC Moldova in 2009, internship within the project “Learn to Change the Future 2009” of AIESEC in Craiova (including work for “Habitat for Humanity” there), various training / facilitation and ecological initiatives related to AIESEC and not only, and the outcome of all these volunteering activities. Fortunately, the pleasant moment occurred again at this year’s edition of “The Festival of Volunteers”, when I was announced to receive the III-rd place within this Award. 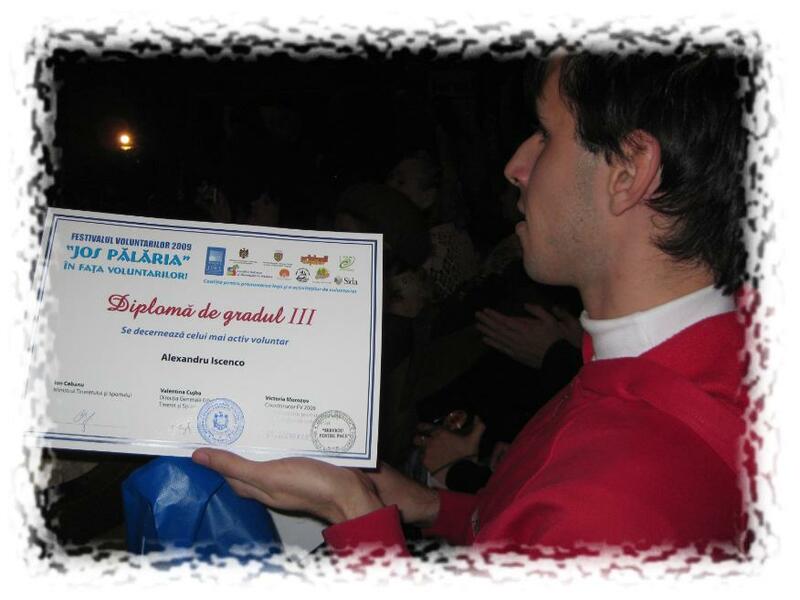 The moment extended with a diploma, a small financial reward, and warm congratulations from my AIESEC friends being at the Festival. – “ONG.MD”: A 7-ea ediţie a Festivalului Voluntarilor din Republica Moldova, 2009. – “Timpul”: Jos pălăria în faţa voluntarilor. – “InfoPortal”: Jos pălăria în faţa voluntarilor. – “Guvernul Republicii Moldova, pagina oficială”: Prim-ministrul Vlad FILAT a participat astăzi la inaugurarea celei de a VII-a ediţii a Festivalului Voluntarilor 2009, cu genericul „Jos pălăria în faţa voluntarilor”. – “Monitorul Civic”: Prim-ministrul Filat a participat la inaugurarea celei de a VII-a ediţii a Festivalului Voluntarilor. – Alexandra Bivol: Află cine este voluntarul anului!!! Yes, this is not the first place, however still a very nice thing to remember. But most importantly, the receiving of this Award indicates once again that the organization AIESEC provides effective and efficient instruments and methods on all levels (local, national, regional, and global) for its members to benefit from in their self-development and personal growth. Whether they wish to demonstrate this fact or not – it is up to them. I am sure there would be a lot more Award winners from AIESEC to display here, if they find some free time in their large schedules filled with managing projects, applying for grants, performing sales meetings, delivering trainings, leading department teams, etc. and fill in the application form for this Award. Another evident conclusion comes to my mind here: not a single significant achievement can be done without other passionate and devoted people to support it. And people – this is what AIESEC is all about. Internship in Romania through the “eXchange” programme of AIESEC described in the previous post “PRICELESS GEM IN MY COLLECTION” is a valuable and unique exhibit in my collection of the X Worlds. Still, it is neither the single, nor the first one. Before applying and going to the internship through “eXchange”, I was responsible for managing this programme on the local, national, and international levels, supporting other people in obtaining their high-quality internship experiences. The very first X World revealed its benefits and challenges, when I entered “AIESEC in Chisinau” here, in the Republic of Moldova, and joined the eXchange Department as the so-called eXchange Development Responsible. We were a small, but quite united team with a kind and passionate leader, Irka Perdeleanu. 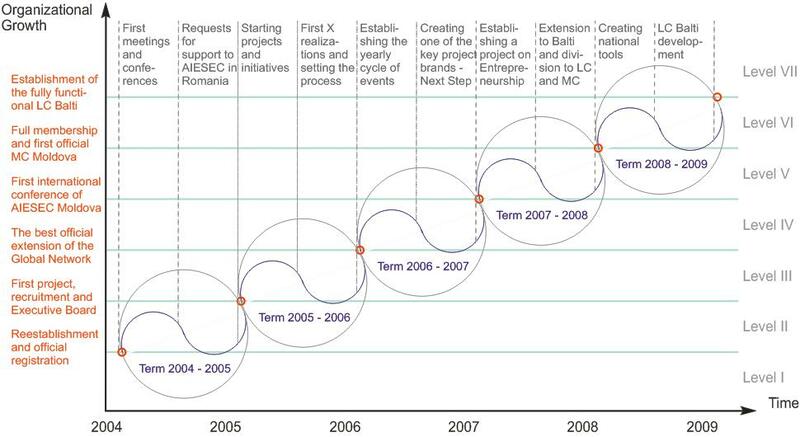 Although we did not achieve significant results, still our team was the first one to introduce various eXchange management instruments in organizational projects and activities, establish the basis of reception practices, negotiate country-to-country partnerships, and implement other important innovations for the growing “AIESEC Moldova”. Members of this generation of the “X Guys” obtained significant leadership positions and organized impactful projects in their further AIESEC career. 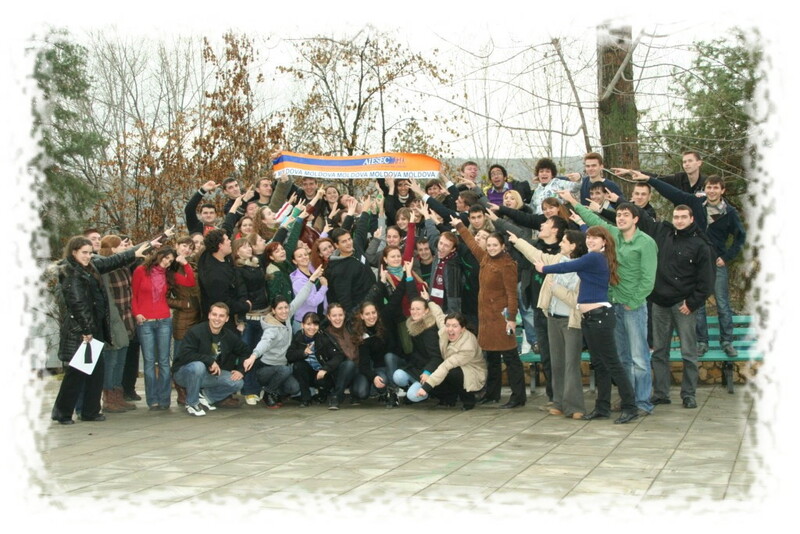 Then came the Evolution: the National Executive Board (usually called MC EB or just MC) of “AIESEC Moldova” was established, and it happened so that I became the first “eXchange” programme responsible (Vice-president of eXchange or MCVP X, as it is officially called) on the national level. Thus the excitement and passion, as well as multiple challenges continued with both old and new nice, hard-working people already in two local committees: Chisinau and Balti. Together we also brought valuable improvements and innovations to the “eXchange” programme here, achieved certain growth both in quantitative and qualitative parameters, and promoted the potential of “AIESEC Moldova” on the national and global arena. The local and national experience was followed by an international one, when I got selected for a virtual team called the eXchange Quality Board (XQB) that is responsible for supporting AIESEC International in developing qualitative parameters of the “eXchange” programme on the global level. 15 devoted individuals from different countries and regions lead by a very responsible Chair, Felipe Dalcin, spent a period of one year working together on reviewing the international policies and standards of the programme, creating and releasing educational materials, coaching AIESEC committees in other countries and supporting them in solving quality-related cases as effectively and efficiently as possible. After finishing the XQB 2008 – 2009 term these people have proceeded further by becoming presidents of national committees, going on internships, or getting suitable and desired job places. Truly, all these three X Worlds were some amazing experiences I enjoyed to live! Many objectives were achieved, many challenges were overcome, many valuable learning points were received, and, of course, many good friends were obtained. Thus, the opportunities were worth taking them. And if you have even a small chance to be recruited in AIESEC and offered similar opportunities, do not hesitate – go for it! You will have a lot of pleasant moments to remember afterwards… and many people to thank for the time spent together… as I do right now. No doubt, I am highly grateful to all those people, who shared the above-mentioned experiences together with me, and say “Thank you!” for the knowledge, skills, challenges, and fun moments you gave me then. For it is true that “as the Great Pyramids are built of many stone blocks, so the success of a person is made of many contributions”. Of sharing our common treasure. Now it’s gone. We’re far away. Nothing more there is to say. GLOBEX: IT’S EXCHANGE… AND IT’S GLOBAL! Nowadays an interesting initiative by AIESEC Moldova is available for young people from the Republic of Moldova to benefit from. It is called “Globex” that stands for the global exchange programme. Started from several ideas in 2008 “Globex” represents the promotion campaign of the “eXchange” opportunity aligned to the specifics of the national market of Moldova. In fact, it promotes the so-called on-going recruitment of people to apply and go on internship at any time of year. Previously it was possible to apply for “eXchange” only during the official recruitment periods of AIESEC Moldova: in spring (February – March) and autumn (October – November). At present, by using “Globex” the organization is able to accept applications and provide young people with the chosen internship experience in any month of a year and all year long. Thus, the applicant should no longer receive such reply: “The recruitment period is over. Please apply next time in spring / autumn”. Instead he / she is invited to the interview, participates at the cultural preparation seminar, chooses the most suitable internship offer and gets the desired international experience. In addition, “Globex” indicates the global character of “eXchange”: a person can go to any of the 106 countries, where an AIESEC committee is present. And that can be done not only once, but twice, three times… one is able to get as much internships as possible within a three-years-limited period of being the “eXchange” participant – this is became possible in 2009 according to the latest updates in the International eXchange Policies and Quality Standards. Thus a person is able to visit many countries, have jobs in different areas, meet people of diverse cultures – in other words, have the real global experience! To sum up, “Globex” keeps the standards and requirements of the “eXchange” programme of AIESEC and spices it with the continuity and clear promotion message for the external market. Yes, it’s EXCHANGE… and it’s GLOBAL!